The paper offers a definition of affect tolerance, discusses three important factors that drive it, and their implications for improving the work with emotions in all therapeutic modalities. What is affect tolerance? Why is it important? Dr. Robert Stolorow, who has co-authored many books on the inter-subjective approach to psychoanalysis from whom I was fortunate enough to get supervision during my doctoral studies, often made the point that the primary task in therapy should be the building of a greater capacity for affect tolerance in clients. His reasoning is as follows: People usually develop symptoms from their inability to tolerate their affective responses to situations. And therapists usually help their clients by helping them to face and process them. We can we expect our clients to remain resilient (or not develop symptoms) in the future when they are faced with similar experiences only when they develop a greater capacity for tolerating such difficult affective experiences during the course of their therapy. It is important to note that both Jungian psychology and Advaita Vedanta emphasize the importance of the building of a greater capacity to develop opposites in human experience for personal as well as spiritual growth. Affect tolerance cannot be defined without specifying a person, emotion or a situation. The ability to experience and tolerate an emotion varies across individuals. The ability of an individual to tolerate an emotion depends on the emotion. A person might have a greater capacity for one emotion than another. And the ability of an individual to tolerate the same emotion varies by situation or over time. For the purpose of this paper, we can say that a person has affect tolerance for an emotion in a situation if no symptoms form when the person has that emotion as a reaction to that situation. What factors determine a person’s affect tolerance? Emotional support: The support one has for an emotion is perhaps the most important factor in determining the person’s ability to experience and tolerate the emotion. This can be in the form of support from others in the present. Or it can be in the form of support from others in the past that has been internalized in the individual. Attitudes towards emotion: A person’s attitude towards an emotion is an important factor in determining the person’s capacity to experience and tolerate the emotion. There can be any number of such attitudes. For example, some people resist unpleasant emotions because they believe that it is unhealthy to dwell on them. Some believe that men should not show any vulnerability and women should not experience anger. Some people do not understand that unpleasant emotions are inherently difficult to experience because they are states of stress and dysregulation in the brain and the body; and that one has to override the innate resistance one has towards unpleasant emotions to experience them and process them. Please note that the two factors discussed so far are related to each other. The more the support one has for an emotion the more conducive one’s attitudes towards an emotion are likely to be. The more educated a person is about the role of emotion in physical and mental health, the more functional the person’s attitude towards emotional experience is likely to be. Embodiment of emotion: The more an emotion is embodied in as much of the body as possible, the easier it is to experience and tolerate the emotion. It is easier to lift not only a bigger load but also with greater ease with two arms than with one. For a more scientific explanation on the role of embodiment in affect tolerance based on findings on the physiology of emotion and self-regulation, please read the paper Improving outcomes in all therapies through embodiment of emotions. The three factors, support, attitude, and embodiment, are related to each other. The more favorable one’s attitudes and the greater the external support for an emotion, the easier it would be to embody the emotion. 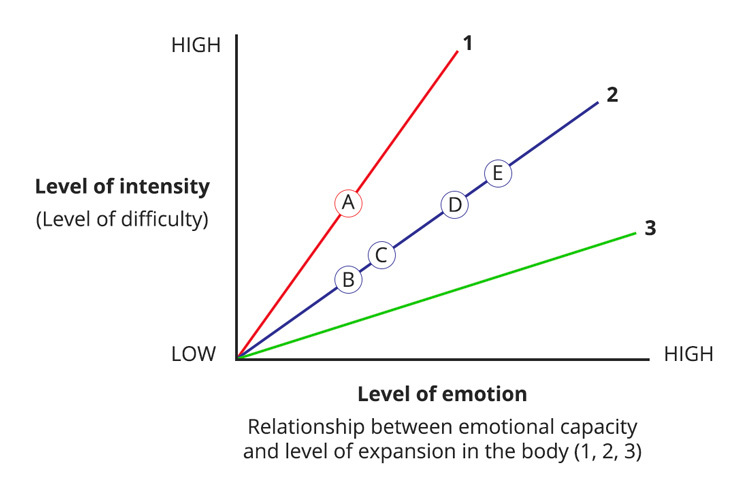 Emotional experiences can be characterized by level of emotion and level of intensity (difficulty). A person might find even low levels of emotional experience extremely intense (difficult) to tolerate, as along line 1. Or a person might find even higher levels of emotion less intense (intense) to experience and tolerate, as along line 3. The more the support there is for an emotion in a situation, the better the attitude towards the emotion, and the more embodied (or expanded) the emotion is in the body, the flatter the affect tolerance profile of an individual will be, as along line 3. That is, the person is likely to experience every level of emotion with lower levels of intensity (difficulty). Or, keeping the level of emotional support constant and the attitude towards an emotion fixed, one can make the affect tolerance profile of an individual for an emotion flatter or more capable by increasing the area of the body that is involved in the emotion. A higher level of emotion when distributed more evenly in the body is less likely to be as intense or difficult to experience and tolerate for any part of the body involved in the experience of that emotion for it to trigger symptoms. Improving affect tolerance can resolve symptoms and increase a person’s resilience so that symptoms do not form in the future. Providing emotional support and improving a person’s attitudes towards an emotion, things therapists do all the time, do help clients by increasing their capacity to tolerate affect. However, not many therapists work with the body in relation to emotions. And even therapists who work with the body in relation to emotion seldom try to expand emotions in the body as a way to develop a greater capacity to tolerate them. Therefore, the scope for improving affect tolerance through increasing its embodiment is considerable in all therapeutic modalities, whether they are already body-oriented or not. It turns out that the benefit of emotional embodiment is not limited just better emotional outcomes. To understand how a greater capacity for affect tolerance through embodiment of emotion can also improve cognitive, behavioral, physical, energetic, relational, and spiritual outcomes in all therapies, please read the paper The science of embodied cognition and enactive emotion: Improving outcomes in all therapies. To read about Integral Somatic Psychology™ (ISP™), a complementary modality developed to improve outcomes in all therapies through emotional embodiment, please read the paper What is Integral Somatic Psychology (ISP)? 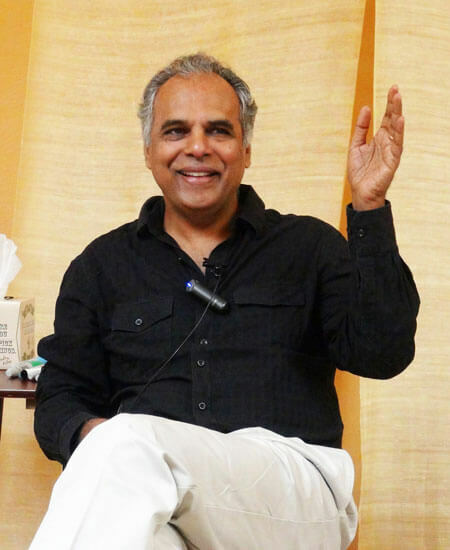 A conversation with Raja Selvam, PhD. To learn more about how to facilitate the experience of a greater range of emotional experiences including the always-present and often-overlooked sensorimotor emotions so that one can always find an emotion to work with in any session in any therapeutic modality, how to identify and work with psychological, physical, and energetic defenses against emotional experiences, and how to expand the body and the energy to expand the experience of emotion in the body in such a way that the emotion, the body, and the energy remain regulated and a greater capacity for affect tolerance is developed, please visit our training schedule to find an ISP training or workshop near you.